Panchatheertha is a new Hindu temple under construction. The name bears the meaning five holy streams. Legend has it that this stream was built to serve the famous five brothers — “Pancha Pandavas” while they were in political exile. 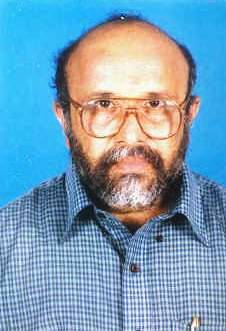 Sree Jayachandra Raj from Changanacherry, Kerala is one of the noted astrologers from Kerala. Realizing the astrological importance of Poovanpara mala, (9.47110N, 76.81786E) being a very unique “Shiva Gulika” Kshetra (temple) used to refer people to that temple for resolving their day to day problems in life. With the increase in number of people going there, eventually Sree Jayachandra Raj started going there himself, every Friday for prayers as well as to answer astrological questions of his own devotees. Eventually he emerged as the leader (guru) of the team and he started chanting Mantras during Friday visits and the disciples started following the mantra’s by offering their flowers as pushparchana in the temple, after which astrological “prasna” was conducted to answer questions of the people assembled in the temple. A few decades ago, on one Friday while the Pooja and Prasna was being conducted, one of the locals came to the temple to dedicate a calf to the temple– a common practice in Kerala. Observing the bad omens when the calf was brought to the temple, Sree Jayachandra Raj informed the temple president that any fatalities to this particular calf would mean disaster to the temple president as well as the person who offered the calf. As a routine solution, Mrityunjaya homam was suggested and the group went on with their routines. Following Tuesday, temple workers found the calf tangled in ropes and lying dead on the steep slope on the northern side of the temple. Authorities panicked and requested astrological help to identify the immediate possible remedies. Following Friday, the team assembled at the temple to do the routine Pooja followed by astrological Prasna. Usually 12 lamps are lit on the “rasi vilakku” to do the prasna. On this day, flames jumped up from the Rasi Vilakku like a fountain and came down as if in a fountain, with out harming any of the people who have assembled around this oil lit lamp. Entire audience was curious to know the reason behind this phenomenon. 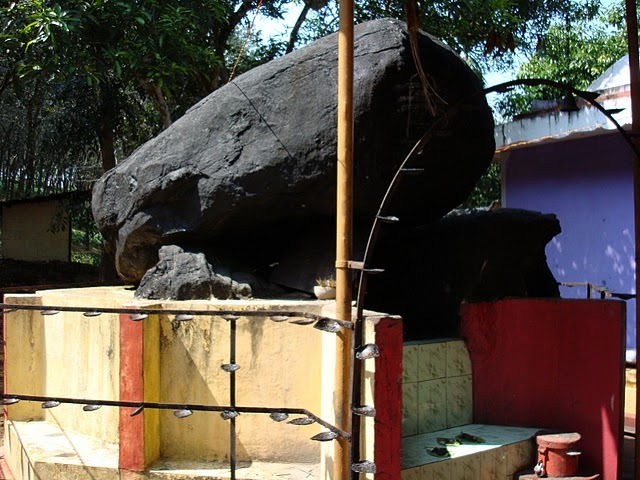 During the Prasna (astrological root cause analysis), Sree Jayachandra Raj proclaimed the presence of Devi Adi Parasakthi at a location 6 yojanas arial distance away (1.5 kilometers) at 120 degrees south east direction from this temple. Sree Jayachandra Raj could visualize a confluence of five different three cascade water falls. He predicted about a large banyan tree on the northern side of the one and a half furlong (301.752 meters) river. A person by the name Markos, who had already passed away, lived all alone on the eastern side of the Banyan tree on a small house built in a platform with 18 steps from the river. Markos used to see the Devi as if in some form of hallucination and used to worship Devi on a trident. Markos had 29 cents of land where his house was located. Physical characteristics of this person were described as a stout dark complexioned person, five feet three inches tall with a round face and round palms. One the western side, he sited an inactive non electric water pump, (diesel / kerosene powered) completely covered by wild vines.During the Prasna (astrological root cause analysis), Sree Jayachandra Raj proclaimed the presence of Devi Adi Parasakthi at a location 6 yojanas away (1.5 kilo meters) at 120 degrees south east direction from this temple. Sree Jayachandra Raj could visualize a confluence of five different three cascade water falls. He predicted about a large banyan tree on the northern side of the one and a half furlong (301.752 meters) river. Goddess Adiparasakthi’s presence was extremely evident at this location – all the way from Banyan tree to the place where Markos lived. President of the Poovanpara temple, Mr. Prabhakaran denied the complete story and challenged Sree Jayachandra Raj since he never heard of anything like this just a few kilometers away from this temple – which was an area well known for him. Astrologer Sree Jayachandra Raj insisted that the Indian astrology is a science that never fails and went out to search for this property in the same night. The team including Mr. Vishwantahan Nair, Dr. Bajisen, Mrs. And Mr. G. S. Nair, Prof. Kesavakumar and Mr. Prabhakaran was determined to locate the temple premises the same night and they left out in search of the temple in the pitch dark night at around 8.30 PM. Given his profound knowledge in astrology, Sree Jayachandra Raj lead the people around by giving them directions on the fly based on astrological positions. He directed the driver with turn by turn directions purely based on astrological co-ordinates at that point of time. He asked the driver to start moving in “Chinga Rashi” until a fork on the road and then turn right to “Kanni Rashi”. He expected to find the water falls a kilometer from the fork. Once they reached the expected spot, which was dense forest and that too in pitch dark. Sree Jayachandra Raj again used his astrological powers to identify the path with out snakes and other danger and lead the team through the dense forest. At 10.20 PM in the night, the exploration team reached the waterfalls. He showed the eighteen steps, the Banyan tree and the location of Markos’s house to the accompanying people. The entire team was absolutely surprised to locate such a location (9.48010N, 76.82500E), purely based on astrological hints. Three weeks later, one a Friday just before Makara Vilakku, Sree Jayachandra Raj went to this location along with his followers and lit a sacred ghee lamp at one minute after 6.00 PM in the evening to invoke the presence of Sree Adi Parasakthi. As per the astrological observations at that time, Sree Jayachandra Raj proclaimed that many business units will form around this location and thousands of families will be saved by this temple. First formal Pooja was performed in this temple on Makarvilakku day on January 14th evening by the priests from Changanacherry / Vazhappally Karakkattu Madom. The three main priests who received this privilege are Prakash Namboothiri, Pradeep Namboothiri and Prasad Namboothiri. Since this year, every year on “Thrukketta” day of Vruschikam month as well as on Makaravilakku day, elaborate light festival (deepakkazhcha) is being performed at the temple site. In January 2006, the great Saint Swami Sathyananda Saraswathy Thiruvadikal of Sree Rama Dasa Ashram, Chenkottukonam, Thiruvananthapuram visited Panchatheertha temple. Through His divine vision, Swamiji revealed that this was a very flourishing temple many thousands of years ago. The Deva's used to (and still do) offer prayers to Devi using bunches of flowers (pookkula). As it happens from time to time, temple went into a decline. During Pancha Pandavas' visit, lord Krishna had again revived the temple. After a few thousands of years that civilization also eroded. With this third revival, this temple will come back to prominence and will be the shelter and hope for many thousands of people world over. The first service organization to start from this location is Panchatheertha marriage bureau. This non profit set up is being established to help people to find astrological solutions to identify reasons that cause delay for marriages of registered participants and identify appropriate remedies. This establishment is open to all people who believe in it, irrespective of their caste, creed and nationality. Other establishments in the making are, low cost book binding, Cafeteria etc. Every Friday Sree Jayachandra Raj reaches this temple location and does astrological findings for his devotees. Innumerable number of devotees travel across the world to visit this temple in this deep forest location on each Friday. Temple is located South of Erumeli near picturesque Harrison Malayalam estates, now called Cheruvalli Estates. This second largest tea producing company has 25,000 Hectares land area under its fold of which 15,000 hectare is planted with Tea and Rubber. Though still not constructed, temple experience the presence of Lord Shiva through neighboring Poovan Para Mala and Lord Vishnu through Pancha Pandavas. It is also beleived that Lord Krishna has requested the presence of the most powerful goddess Adi Parasakthi to protect Pancha Pandavas during their exhile. The divine presence of the god, today is giving relief to hundreds of devotees who reach this divine destination through painful journey through the forests. Ayyappa poonkavanams starts from here. From that aspect, this temple can be considered as the beginning of the poonkavanam.